Keerthi Sugumaran is an Associate in the Boston, Massachusetts, office of Jackson Lewis P.C. Her practice focuses on representing and defending employers in workplace legal issues, including preventive advice and counsel. 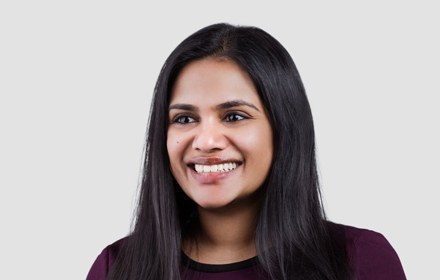 Prior to joining Jackson Lewis, Ms. Sugumaran worked at a Boston law firm for over four years as a general litigator. During this time, she represented employers in front of the MCAD, EEOC, state and federal courts. Ms. Sugumaran also participated in a six-month secondment, working in-house for a private equity firm. While attending law school, Ms. Sugumaran was a member of the Suffolk Journal of Trial and Appellate Advocacy and the Chief Competition Director of the Moot Court Honor Board. Ms. Sugumaran was a semi-finalist in the Thomas C. Clark Appellate Advocacy Competition, as well as a quarter-finalist and second speaker at the Foreign Direct Investment International Moot Court Competition. Ms. Sugumaran was named to the Dean’s List from 2008-2011, received the Jurisprudence Award in Civil Procedure, the Dean’s Public Citizen Award and the Scales of Justice Award. During her undergraduate studies, Ms. Sugumaran received the Philo Sherman Bennett Award for Best Thesis in Government & Legal Studies and was named to the Dean’s List in 2006.